I love this little appetizer. It is pretty to serve and delicious to eat. I can’t get enough of the pâté and I am secretly eating it as I am assembling. Preheat the oven to 400. Line a baking sheet with nonstick foil. Cut the eggplant and squash into thin rounds, about the same size. Roast for 25 to 30 minutes until soft. Let cool enough to handle. Place everything in the Vitamix or blender and process until thick and creamy. I like to make the pine nut sauce first and let it sit for a while to let the flavors combine. It is also good on its own and in pasta or anything that calls for creamy cheese. And there will leftovers after you make the pâté. Process the artichoke hearts in the food processor until shredded and then mix with the pine nut cheese. 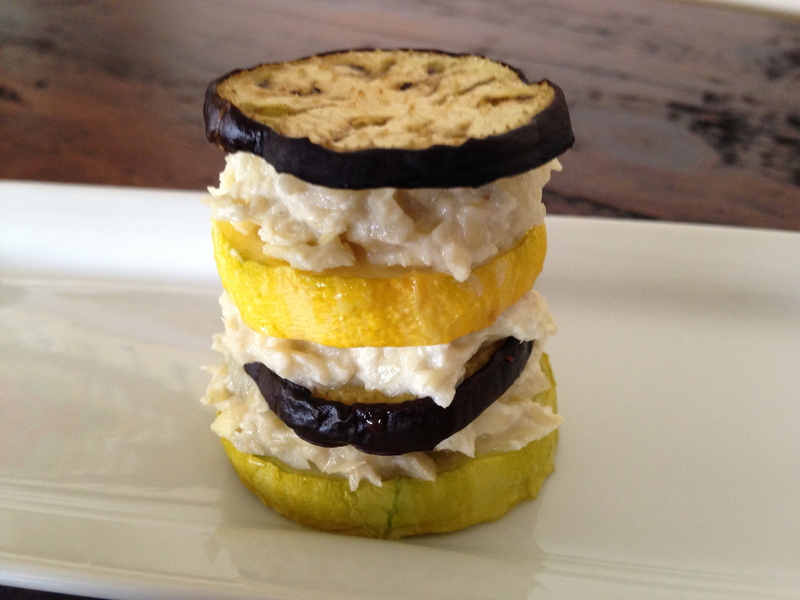 To make the napoleons, stack the squash on the bottom of a plate. Drop a spoonful of pâté on top and layer with a piece of eggplant. Continue until you have a little tower. Make as many as you can with what you have. Enjoy!